Inspire worship with songs that explore the history of African-American spirituals. Days before Hurricane Katrina hit New Orleans, Stephen Lee and his family were forced to evacuate their home. When approached by the American Music Therapy Association to provide a musical response to the devastation, he jumped at the opportunity. That song—which would later become the title track of this collection—served as an inspiring call to prayer and healing. Stand by Me explores the development and history of African-American spirituals, combining a diverse range of musical styles and influences. Powerful when performed as a complete work, these songs are equally beautiful when shared individually within the context of worship. From chant and soulful blues to the rhythms and harmonies of gospel and jazz, soloists and choir converge as catalysts for celebrations overflowing with an irresistible joy. The collection's title track, "Stand by Me" is a reflective, Taiz?-like mantra intended for assembly and choir. "Standin' in the Need of Prayer" offers a booming synthesis of 20th century blues and gospel traditions. The somber "Walk with Me" and energetic "When the Storms of Life are Ragin'" epitomize the musical and emotional contrasts found in this powerful collection. 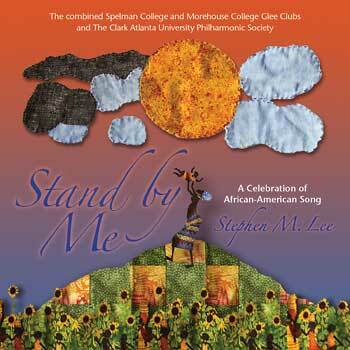 Narrated by Father Edward Branch, Stand by Me features performances by renowned vocal groupsùThe Clark Atlanta University Philharmonic Society and the Spelman College and Morehouse College Glee Clubsùplus revered musicians E. Dwight Franklin and Reverend Adrian Ford on piano, and Uchenna Echeazu on drums. Whether you lead a choir or simply love African-American spirituals, treat your senses to songs that call for worship with heart and voice. This is the MP3 playlist for Stand By Me. Narrated by Father Edward Branch, Stand by Me features performances by renowned vocal groupsùThe Clark Atlanta University Philharmonic Society and the Spelman College and Morehouse College Glee Clubsùplus revered musicians Dwight E. Franklin and Reverend Adrian Ford on piano, and Uchenna Echeazu on drums. Whether you lead a choir or simply love African-American spirituals, treat your senses to songs that call for worship with heart and voice. The collection's title track, "Stand by Me" is a reflective, Taizé-like mantra intended for assembly and choir. "Standin' in the Need of Prayer" offers a booming synthesis of 20th century blues and gospel traditions. The somber "Walk with Me" and energetic "When the Storms of Life are Ragin'" epitomize the musical and emotional contrasts found in this powerful collection. Whether you lead a choir or simply love African-American spirituals, treat your senses to the songs in Stand By Me as they call for worship with heart and voice.